The snow paradise exists in Italy and it is called Alto Adige. But the region has also got towns with beautiful bell towers, powerful castles, extraordinary abbeys wich mingle gently with the long rows of vineyards and apple trees. In winter all is covered by a snowy landscape. The pine woods forests and tiny alpine lakes of the Dolomites mountains, which boast pinkish hues which change to yellow and orange as the sun runs in the sky, are marvellous and peaceful. 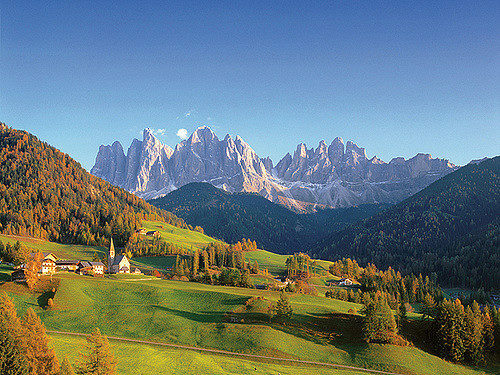 Every single tourist loves this itinerary through four valleys of the Alto Adige!!! The valleys are Passiria, Isarco, Pusteria and Aurina. Passiria are full of ‘masi’ (estates) with hay lofts, bee hives, outside ovens. Interesting the water mills close to the vineyards on hills, the green fields and pine woods; after a long walk you should try a ‘stube’ (taverna) for a tasty rest. In Val d’Isarco Vipiteno, a visit will be payed to Bressanone and Novacella. Both towns offer a different landscape, culture and reality, almost fiabesque. The Val Pusteria opens the spaces up, providing fields and woods descending in soft waves. Fantastic monuments you will find in San Lorenzo di Sebato or in Brunico. From Bolzano to Merano is easy to go and this city has kept the atmosphere of its belonging to the Ausberg Empire: here in Merano the European aristocracy gathered for the thermal visiting.Up the Valley Passiria , we will pass San Leonardo to go over the Passo di Monte Giovo, descending to Vipiteno/Sterzing and then to the abbey of Novacella and to Bressanone/Brixen. The Valley Aurina is the narrowest one and one of the most uncontaminated of the region, and the towns have wooden houses in German style. Here you can hear the sound of the waterfalls and feel the close glaciers in the cold but limpid air. Casere/Kasern is in a conch in the woods, with the glacier peaks. Among them Vetta d’Italia the most Northern point of Italy. This entry was posted on Saturday, November 3rd, 2012 at 7:46 pm	and is filed under Discover Italy. You can follow any responses to this entry through the RSS 2.0 feed. You can leave a response, or trackback from your own site.